NASA satellite captures photo of bizarre circle of clouds | Watts Up With That? Sometimes, nature just gives us the weird. While clouds are an important topic of research for climatologists and meteorologists, sometimes the atmosphere churns up peculiar-looking cloud formations that are as notable for aesthetic reasons as they are for scientific ones. 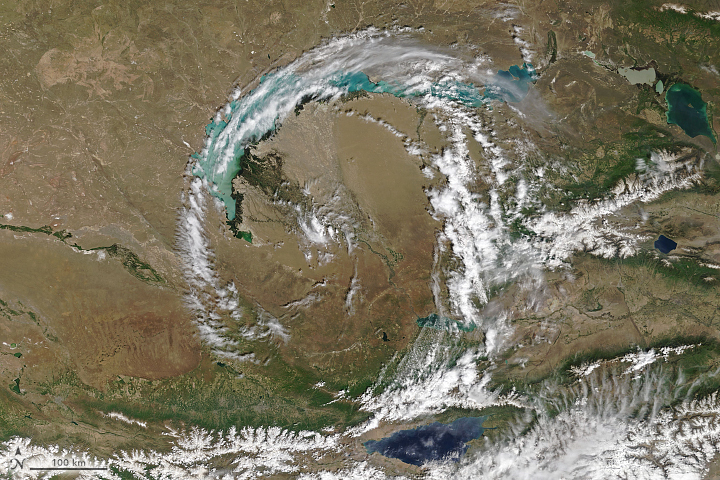 That was the case in May when this circular swirl of clouds drifted over Lake Balkhash in eastern Kazakhstan. In fact, as a nearly perfect circle, it could serve as a worthy alternate “O” in our Reading the ABCs from Space image gallery. While the MODIS sensors are affixed to polar-orbiting satellites and take an image of each part of Earth once per day, the Indian Space Research Organization operates a geostationary satellite—INSAT-3DR—that keeps its gaze fixed on this part of the world and captures new images every 26 minutes. Imagery from INSAT-3DR helps fill in the gaps before, after, and between the two MODIS images. 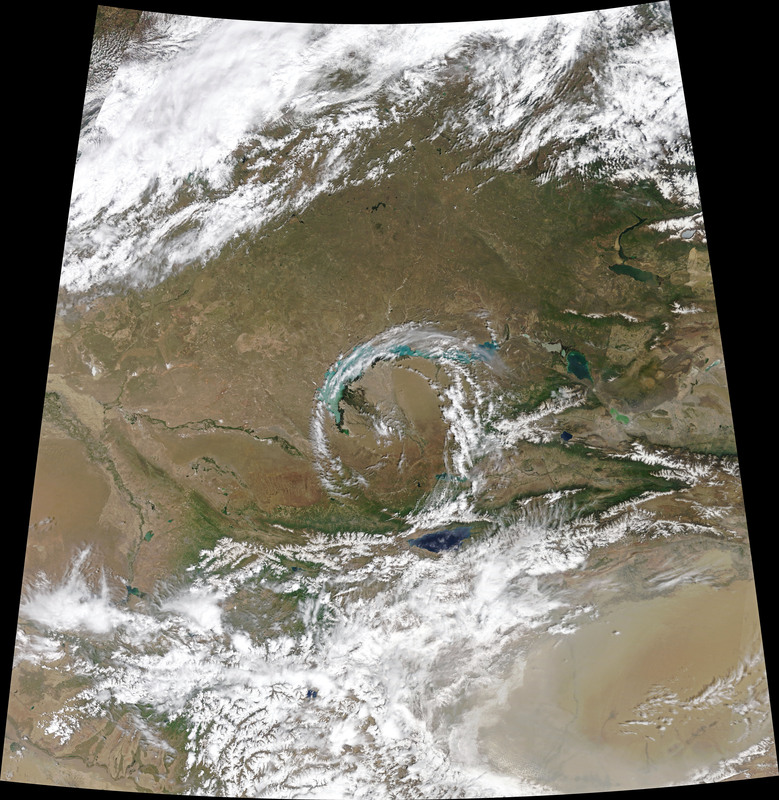 The INSAT-3DR imagerysuggests that a few hours before Terra MODIS acquired the image, the circular feature was linked to an area of convection to the southwest over the western Tien Shan mountains. It’s worse that we thought. One might expect large vortices in the lee side of the Himalayas particularly during monsoon events with strong southerly flow. That’s a long way from the Himalaya or even the Karakorum. It seems to have some characteristics of a tight Jet Stream eddy. Fascinating!!! Or perhaps it’s the dreaded CHEMTRAILS! No, it’s the HAARP array! Local water transport into the atmosphere. Surface water evaporates, rises, and circles the source under a cut-off low. Trapped by the mountains to the south. 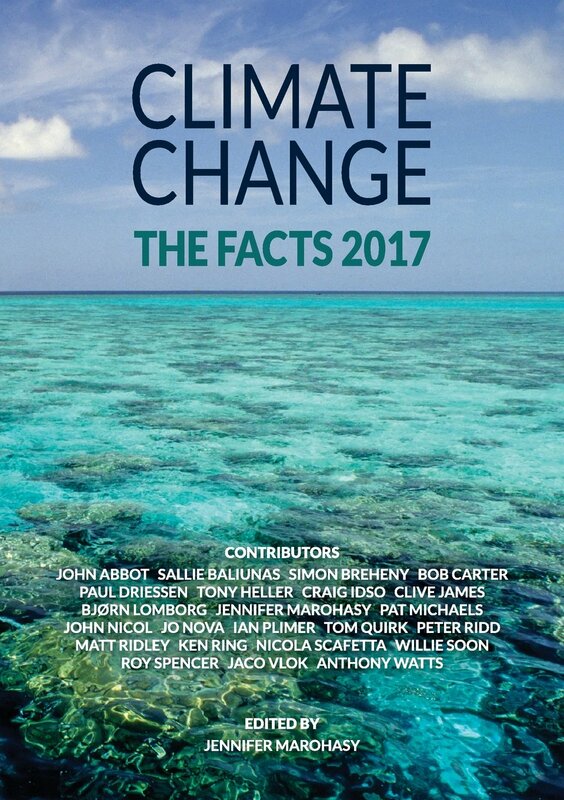 A wider satellite imaging would have revealed a cloud formation to the distant left in the shape of a giant “C” and to the distant right a swirl of cloud with a little “2” – so now we know where all that extra “carbon” is lurking. That would be signaling that has nothing to do with virtue. By the way, not all the white in that photograph is clouds. At the bottom left, bottom right, and due right, the fractal edges of whiteness are clearly snow on mountains indented by valleys. That doesn’t change the beauty of the cloud circle though. To much of that circle is snow on top of mountains. Unsure what we are really seeing. First it was the crops, and now the clouds. It could also be a Q, so maybe God is trying to tell us something. That John DeLancie needs work? It looks like a crater. There is even a puff of cloud in the middle that looks like a central rise. The clouds appear to have counter-clockwise rotation and in the Northern Hemisphere with the wind at your back the low pressure is to your left, so the rotation is around a low-pressure center. Or Stonhenge II writ large. 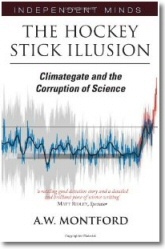 CO2 driven and you know it…. That is so utterly COOL!!!! It is definitely a ‘ Q ‘! First time in recorded history! Must be due to CO2!! All right, Barbera, there was no alien. The flash of light you saw in the sky was not a UFO. Swamp gas from a weather balloon was trapped in a thermal pocket and reflected the light from Venus. I don’t know the reason for this. If I did, it would be a case of circular reasoning. You can’t fool us. CERN did that!